Google has further expanded its mobile offerings with the introduction of a Java Gmail client. The previously available WAP version of Gmail is still supported, but the application will give a more consistent experience across phones. Google is making the application available for free though data charges still apply. Early reviews of the application have been positive. 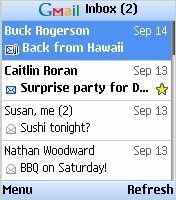 In related news, Sprint Nextel announced that a download link for the Gmail application will be placed on their PCS Vision deck. Contrary to some reports at this time Sprint is not planning on shipping handsets with Gmail pre-installed.